2. heat up your kitchen appliance to 375 degrees. mix the panko breadcrumbs, Parmesan cheese, dried basil, dried oregano, and garlic powder during a shallow dish. during a separate dish, gently beat the eggs with the water. 3. Dip the eggplant slices within the egg then the crumb mixture, pressing the breadcrumbs onto the eggplant to equally coat either side. 4. Drizzle a foil-lined sheet pan with the vegetable oil and unfold it around to hide the complete pan. 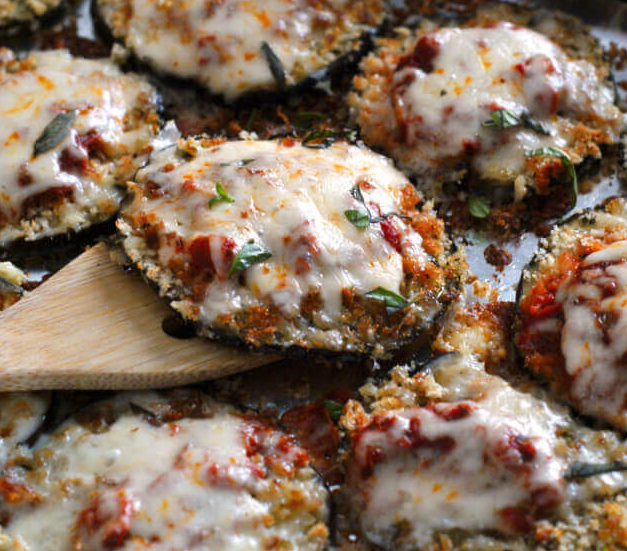 Place the breaded eggplant during a single layer on the baking sheet. 5. Bake within the preheated kitchen appliance for quarter-hour, flip the slices, then bake for an extra ten minutes on the opposite facet. Spoon sauce onto every slice and prime with cut cheese. come back to the kitchen appliance and continue baking for an extra ten minutes, or till the cheese is unfrozen. prime with contemporary basil right before serving. 0 Response to "Sheet Pan Eggplant Parmesan"